The Gymstick Fitness-Bag provides an efficient strength and core training. 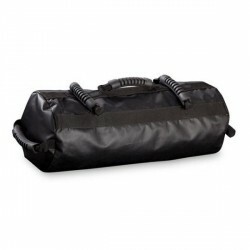 The weight bag Fitness-Bag is well padded, sturdy, and weatherproof and is great for indoor and outdoor use. The Suples Bulgarian Bag ® team (leather) is the insider tip for Functional Training. Originally developed for wrestlers, it is used for strength, skill, and functional training today. Being available in different weights, everyone finds the appropriate bezeichung. The insider tip for Functional Training! 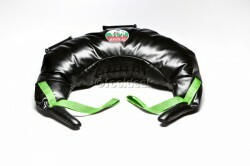 Compared to other Bulgarian Bags, the Suples Bulgarian Bag Strong is even more flexible. Increase the intensity step by step with 3 additional weights and control your training. The training variety is big and varied as usual. Either for functional training or as training device for martial arts - the Bulgarian Bag is tested and approved. The Taurus 15-50LB Sand Bag is a versatile piece of exercise equipment suitable for a number of different training methods, be it classical weight training or the popular functional training segment. 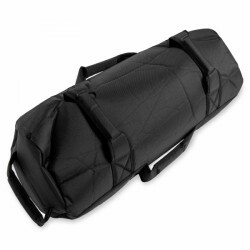 The Taurus sand bag comes unfilled and can be filled with up to 25 kg of sand. 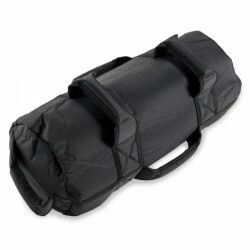 The Taurus Sand Bag 40-80 LB is a versatile piece of exercise equipment. Classic strength training as well as functional training exercises can be performed with this sand bag. It is of very high quality and, as it is filled with sand, its weight is variable and can be adjusted to suit the user's needs. 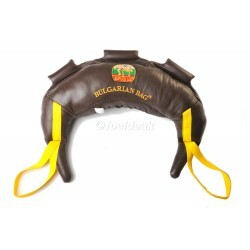 The Suples Bulgarian Bag ® team (Vinyl) is ideal for strength and stamina training. Due to its flexible shape and use, the training possibilities with the bags are almost unlimited. The hard-wearing vinyl makes it very resistant and easy-care. The SKLZ punch bag Super Sandbag helps to improve strength, stability, and stamina. Tis 4 weighted bags can be filled with 4.5 kg of sand each and are can be uses separately for strength exercises. The blackPack® PRO is the perfect partner for Functional Training, offering many possibilities for new and effective weight training. Due to its unique construction, it makes exercising with instable weight and shape possible, where the weight (i.e. sand or water) moves freely in the device, as well as fixed. It is produced by an innovative compression system. blackPack PRO SET TOP makes many well-known training methods of Functional Training and Grip Power training possible! Ideal for swing, pressure, and pull exercises ! Designed in Germany - Made in Europe. 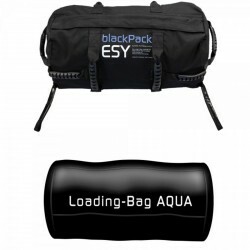 The blackPack ESY Set AQUA is quickly and easily filled with water. Due to its instable weight, which moves freely in the sturdy blackPack bag, new, challenging training stimulations come up which are immediately noticed. 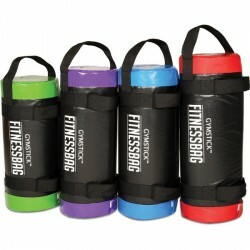 blackPack ESY Set AQUA makes many well-known training methods of Functional Training or Grip Power training possible! The Ultimate Sandbag offers more than weight training. Toughen your body and exercise your muscles, you do not demand with common workouts, with the functional strength training. The Ultimate Sandbag is available for fitness beginners and well-exercised athletes. After spending hours on the internet reviewing the different makes of Bulgarian Bags and comparing prices, I decided to purchase the Suples Strong model from Sport-Tiedje (ST). The I chose this make and style of bag because it is definitely the best on the market. The quality of make is second to none. It is superb quality and built to stand the rigors of hard training. Suples have listened to their customers and incorporated the latest updates to the handles and straps to make this bag more effective and efficient for training. The new design means you won't find a better bag on the market. The Suples Strong model allows you to adjust the weight with one bag and so you won't have to purchase another bag as your strength and mobility increases. The adaptability of this new model makes it excellent value for money. I can only think of positive comments to make about this bag and haven't got a negative point to mention. The service from (ST) is excellent and their customer aftercare prompt and supportive - well done! 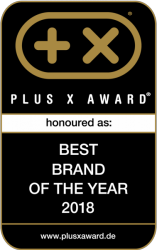 To round up - the quality is excellent, the price from ST provides the best value I could find on the market, and their customer care is perfect. As a final note - this is an independent review, and I have no vested interest in Suples Ltd or ST - this is my review to help other people decide on the best option for them - good luck! Great core strength tool that can be used for many different exercises. All I have expected to get, i got. I had a cheaper and simpler version of a sandbag before - it had only 4 handles in total and it leaked sand. With this one - all materials are better, handles fit well in your hand, the filler bags are solid and take in A LOT of sand and there is no chance of leaking. This is truly multifunctional and very good quality. Worth the price. Experience a completely new training exercising with a sandbag. In the US, the bags filled with sand have been part of the daily but also advanced training for a long time. Thanks to the sandbag training you achieve completely new results compared to common weight training. Strength, stamina, stability, balance, coordination, and explosiveness are facts which you can improve ideally. 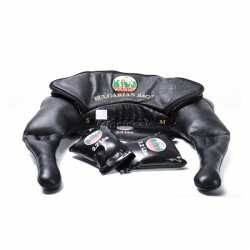 Thus sandbags and Bulgarian Bags are very popular among allusers and enjoy a cult status among sports clubs and martial artists. That's du to the versatility of the sandbag training and that you train strength and movements doing a sandbag training. In addition, every sandbag can be filled individually! Sandbags are not boring sandbags for stopping floods but are very versatile and effective training devices. What makes the sandbag so outstanding and innovative? The sandbag is not stiff but flexible. The body has to counteract continuously the moving sand. Thus the body has to react to the moving mass and that demands muscles, which you do not reach with common weight training. Stabilise and strengthen your trunk, prevent painful back pain or increase your strength-stamina. No matter whether you prefer holding, swinging or lifting movements, everyone finds the certain something doing sandbag training. The principle of instability simulates movements, which also always come up in daily life. Imagine how you try to heave your hand luggage in a case in the airplane or in the train. Workouts with sandbags or a Bulgarian Bag prepare your for such situations and many others! An unmatched plus of the sandbag is the change of weight. Due to the individual filling of the bag, you regulate your resistance of the training. Depending upon the product, you can adapt the weight of resistance up to 60 kg. At the beginning, the sandbag training should be done with basic exercises. Swinging movements or rotation movements are not suitable for sandbag beginners. Many sandbags include illustrated instructions or a DVD with exercises. At the beginning, you should work with a low weight in order to get used to the new handling. Another advantage of the sandbag training is the training effect on the grip power. 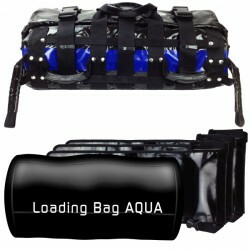 Some sandbag versions offer different grip possibilities and thus a much higher variety of exercises. That means you get new stimuli and effects for the muscles and the whole body doing sandbag training. Either at home, at office, on trips or on holiday, you can always do your training. Take you sandbag unfilled along on holiday. You can find sand for filling everywhere. Being unfilled, the sandbag fits in every suitcase. A simple bag becomes quickly a versatile and complexe training device for the perfect whole body training - more than ever at the beach!